There is huge variety of swimming pools available on the market and exact measurements define solely by manufacturers. Actual width, length and depth will depend on a swimming pool shape and type with no strict standardization in any dimensional parameter. Before making a purchase always check manufacturer specifications for a product you are planning to buy because even same water capacity swimming pools might have different measurements and will consume more or less space in your backyard or inside the house. Even though dimensions of swimming pools vary significantly there are some common of typical sizes of prefabricated above and in-ground pools. 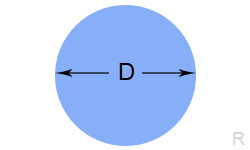 D – diameter of a swimming pool in imperial units (feet) and metric system (meters). S – surface area in square feet and square meters. 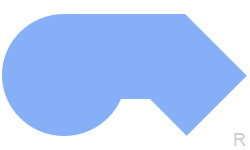 W – swimming pool width in feet and meters. 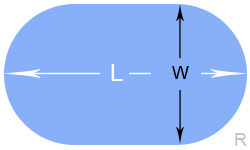 L – swimming pool length. Round and oval in-ground swimming pools are often similar in dimensions to above ground pools. What is standard depth of swimming pool? Normally swimming pools made 42 in (106.7 cm), 48 in (121.9 cm), 52 in (132.1 cm) and 54 in (137.2 cm) deep, but other sizes available as well. Many in ground pools have a slope and can be up to 8 feet (2.4 m) in the deepest point. Total height of above ground swimming pool is normally 5” – 9” smaller comparing to water depth when the pool is fully filled. How to calculate water capacity of swimming pool? For pools made or build in a free shape you might need to contact a manufacturer about the pool specifications. What are typical sizes of in-ground custom build swimming pools? On site custom build swimming pools cannot be summarized to any typical measurements and technically they can be made any width, length and overall shape. Even though there is no restrictions in design there might be depth regulations according to local building codes and safety requirements. Note: All numbers in the charts are approximate and calculated using mathematic formulas. Actual swimming pool dimensions might very from manufacturer to manufacturer.